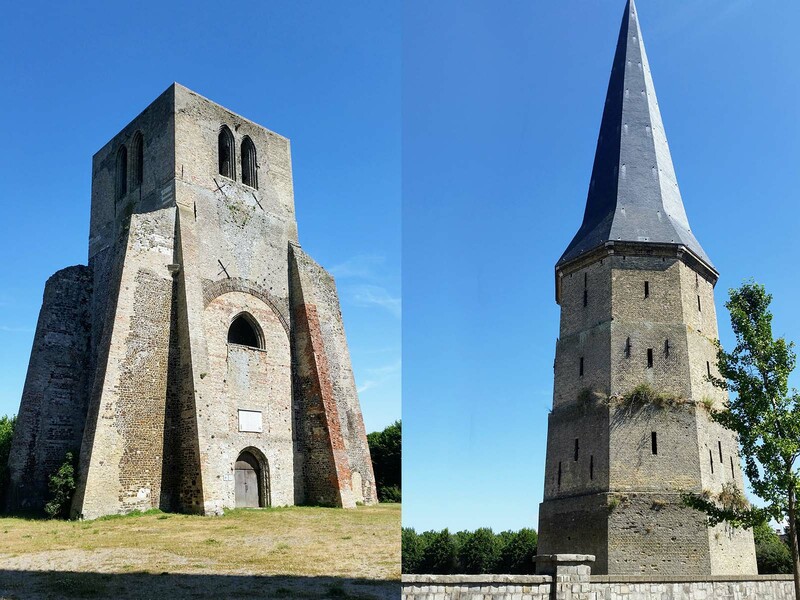 Saint-Winoc went to Bergues during his mission of evangelization of the region, the Counts of Flanders, from 1022, built a Benedictine abbey on the site of the saint’s passage, with mission to guard his precious relics and to promote his worship. The Abbey is built on the "Groenberg" (or green hill), 22 meters above sea level which occupies the entire summit. This Groenberg remains for nearly eight hundred years, the property of the religious community. The Square Tower, built at the transept crossing of the old abbey, is the oldest construction of the city that remains. And the Peaked Tower, located at the entrance of the abbey. At the dawn of the revolution, Saint-Winoc Abbey is radiant and prosperous. The 25 monks who live there, enjoy the general esteem of the population. They knew how to maintain the strict observation of the rules of Saint-Benoit. Gateway to the Champs de Mars, now a public garden, the “Porte de Marbre” (Marble Gate) is originally the gateway to the courtyard of the abbey palace. During the French Revolution, the hill becomes an exercise field for the troops and the monks are driven out. Of the rich library of 60 000 volumes, many have been lost. The most beautiful books have been reserved for the communal libraries of Bergues, Dunkirk, Bourbourg and Gravelines. The paintings were scattered in the museums and nearby churches, but many works of art disappeared ... and a few years were enough to ruin the work of eight centuries! Only the Square and Peaked Towers survived the destruction of Saint-Winoc Abbey, acting as a landmark for navigation. The ships entering the Dunkirk Channel took a safe direction by following the two towers of Bergues. In 1812, the Peaked Tower collapsed due to lack of support, and the Ministry of the Navy had it rebuilt. The city bought the site, at the beginning of the 20th century, and turned it into a public garden.